Drom Hytte is a darling Norwegian inspired cabin and long time favorite of North Shore vacationers. Located on the Cascade Beach Road in Lutsen with private, wooded setting and beautiful Lake Superior shoreline, just a short walk to the Cascade River. You will love this Scandanavian-Style cabin on Lake Superior. Roast marshmallows and tell stories on a warm summer evening around the fire. Drom Hytte has its own private section of Lake Superior shoreline, easily accessed down a set of stairs. Drom Hytte means You can enjoy incredible views of Lake Superior from the home and the private 2-acre lot. Enjoy an easy stroll down the wood or stone staircase to the beach area. Enjoy incredibly close proximity to Lake Superior at Drom Hytte. Enjoy the open area living room, plenty of room for the whole family. Grab a seat in one of the picture window chairs with a good book, or let the Great Lake be your entertainment. Curl up in front of the fireplace and watch a movie on a rainy evening. The eclectic array of furnishings just adds to the quaintness of this cabin. Enjoy nothing but trees and water as you gaze out the windows Original custom built-ins add to the feel of this retreat. The small but well-equipped kitchen is great for preparing meals during your stay - and yes, the stove works. Enjoy open living in the great room and don`t waste any time on dishes as this home features a dishwasher. Seating for four around the dinner table where you can enjoy a meal, as well as great Lake Superior views. The master bedroom features a queen bed and a private half bath. The guest bedroom has two twin beds, making this home great for families. The main bathroom features a shower/tub combo. The sign that welcomes you to your vacation rental home. Sit out on your lake-facing deck and enjoy the sights and sounds of Lake Superior. Listen to the waves roll in onto your private stretch of Lake Superior shoreline. The adorable play house is great for kids. Let their imaginations run wild in this playhouse. Shoreline access to your own private beach is easy, down a simple set of stairs equipped with hand rails. The area of private ledge rock beach located in front of the cabin. Looking down the other side of the private ledge rock beach. Just you, your cabin, some trees, and water - the makings for a great North Shore getaway. Blue water and blue skies can turn to gray skies and high waves&59&59&59; there`s no lack of drama when it comes to Lake Superior. The view from your lake-facing deck. One final look at this adorable cabin, which can be yours for your next Lutsen vacation. The ledge rock shoreline and tall, mature trees make this a nature lovers dream. With very few neighbors, you will enjoy a lot of privacy during your stay. Come and enjoy the clean air and refreshing waters of Lake Superior at Drom Hytte. Nothing but water for as far as the eye can see when you look out over Lake Superior. Drom Hytte, right at the water`s edge, can be your new Lake Superior home away from home. Agate Bay is a bright and cheerful Lake Superior home located in Grand Marais, MN. Located on the ever popular Cascade Beach Road, Drom Hytte is Norwegian for "dream cabin" and that describes this delightful property to a "T". You will be charmed by the thoughtfully placed Norwegian decorating touches throughout the cabin making it a comfy and cozy North Shore retreat. It's nestled in a quiet and private little bay that affords stupendous views up and down the coast of Lake Superior. Drom Hytte has 2 bedrooms, 1.5 bathrooms, and a sofa sleeper in the living room. A separate little playhouse is also on the grounds, which is sure to be a hit with the youngsters. 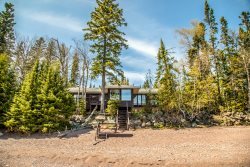 The home is located on 250 feet of private Lake Superior shoreline and approximately 2 acres, giving you the utmost privacy during your vacation. You may be tempted to never leave during your stay, but should you be on the hunt for a great outdoor adventure you've come to the right place! The Lutsen area offers everything from miles of hiking and biking trails to the Midwest's premiere downhill skiing destination - Lutsen Mountains. Head up during the summer months, as well, to enjoy the alpine slide and take a scenic gondola ride up the Moose Mountain Summit where you can enjoy breathtaking views of Lake Superior. Cascade State Park is just a couple of miles away and features a gorgeous waterfall after a short, easy hike. You are also just a short drive away from several restaurants (some only open in the summer months) and quaint, locally-owned shops. For a better idea of the shoreline and privacy at this great cabin, check out the Drom Hytte Aerial Tour! Dogs are welcome with prior approval and an additional fee. 2 dog maximum. Cats are not allowed. We will be back, have been staying an Cascade vacation properties for over 10 years now, we wouldn't look elsewhere. As always we enjoyed our stay and the little cabin on the lake! The cabin was clean and fully stocked with an thing you could possibly need, with the exception of a crockpot ;) The views from just about anywhere in the cabin are very scenic! We enjoy taking photos of the sunrise and sunsets, taking walks, hiking, playing with our pups, or just reading near the large window overlooking the lake. Everything here is well maintained and there have been a few upgrades since our last visit, proving that they are taking care of the guests needs. Nothing to complain about, at all! Nice cabin right on the lake. Love that they take pets. The view from the living room seems like you are right on the bridge of a boat. We have stayed here before and it is one of our favorites. The house is lovely, the location is great and we love the yard and fire pit. It is a little pricey for two but we spend a lot of time there relaxing and enjoying the lake. It's always easy to work with the staff at Cascade Vacation Rentals. Always pleasant and I like that someone follows up with an email after the arrival date to be sure we arrived, checked in, etc. its a nice extra touch that you wouldn't have to do, but it is really appreciated. Tthe website has an ample lot of photos of each property so one can see exactly what you are reserving. I like the details provided because it takes the guesswork out of what to bring or expect, i.e. WI-FI, towels, iron, etc. This was our third stay at Drom Hytte. We absolutely love the cabin and its serene landscape. The owners have taken great pride in their property, even down to the household items. Furniture and beds are very comfortable, wonderful northwoods artwork, and the kitchen is well supplied with very nice dishes and miscellaneous. I have rented through Cascade Vacation Rental many times and have always been very happy and satisfied. They communicate well and are pleasant to deal with. Beautiful location, nice property, great house! The house was perfect for four of us and had everything we needed. Cascade Vacation rentals is great to work with - we have in the past and have already made reservations for July. Lovely little cabin close to the Lake. The website is very easy to use and the staff knowledgable and approachable with questions. there are no surprises in arranging services or determining costs. Pictures are really nice on the website and it is also very user friendly. I also liked that you sent a follow up email asking if we arrived as planned. that was a nice touch. We have stayed at several of your accomodations, but Drom Hytte is our favorite. Its warmth, charm and location are absolutely perfect. No complaints. Responsive and accurate. Of the many Cascade properties we have stayed at, Drom Hytte is our favorite. Red Cove was right up there, but is no longer a rental. Location is awesome. Cabin is equipped with everything you need. All communication was via email. Emails and property information was very detailed. We had no questions, so no need to call. The location was amazing! We loved hearing the waves and the property felt very private. Everything was accurately described on the website and we couldn't have been more pleased with our stay at Drom Hytte and plan to return. We are huge fans of Drom Hytte and continually choose this location for our family vacations on the north shore. It is convienently located between Lutsen and Grand Marais, just off hwy 61. Situated on a lovely wooded piece of property right on the lake shore. A I've cobblestone beach on one side of the jettison, and ledge rock on the other. Best of both worlds! The cabin is very well maintained, clean and comfortable. The kitchen is well stocked with utensils and pots and pans. There isn't anything we found that we needed extra with the exception of an espresso maker and large crock pot. The owners have thought of everything, from dog toys in a basket to two sets of binoculars to look out at passing ships. There is an abundant amount of wildlife for entertainment. We had a small herd of deer visit everyday in the afternoon. The owners continually maintain and upgrade the property, the latest upgrade has been shades added to all windows facing the lake. The sun can be very intense at certain parts of the day and this helps a great deal. There is a fire ring just outside the door, and a wood pile for feeding a fire. Seriously, Drom Hytte feels like it is our cabin, and we treat it as such. One area needs addressing, the kitchen table chairs need some reinforcements. They are very loose and one is an accident waiting to happen. Otherwise, this place is a gem! This was our 3rd time at Drom Hytte. Terrific location! Nicely furnished. Twin bed mattress (at least one should be replaced. Very uncomfortable.) Nice fireplace. Still remember when it was a wood burner. My husband and I really loved our stay at Drom Hytte. The home was very comfortable and clean. The view from the living room window was beautiful. I loved the shoreline and the privacy of the property. Our dog was able to run loose because of no visible neighbors on either side. It was a perfect stay for us and we really appreciate the owners sharing this wondering place with others. The fireplace was nice and actually heats the whole place very well. It is a convenient location in between Lutsen and Grand Marais. I loved Cascade Beach Road being off busy highway 61. We are hoping to return next year. The location was perfect! It has some of the most unique shoreline on the lake. The home was well kept and everything worked well. We loved how clear all of the directions were throughout the home. We wish we would have had more time to just sit and relax at the property. We stayed here last year and knew we would come back. Love the comfortable chairs out and in. Great location. A little expensive for 2 people but we spend a lot of time there relaxing. Have used Cascade the last five years we stayed in the area. Always a good experience. We've been renting from Cascade for many years. Have rented Nordcapp,Jusama,Robins Nest, agate Beach, and Red Cove to name a few, Red cove being our favorite in the past. Been trying for the last three years to book Drom Hytte but the owners were always there when we needed it. We were glad we kept trying as we got it this year! We loved it and it gave us the opportunity to have family join us for a few days. We like being on the water and having all the extras it provides. The only downside to any of your rentals is dealing with refuge. It requires long trips to and from the cabin to your garbage location.We are involved with Cathedral of the Pines Camp so staying on the shore during meetings is a plus. The house and location were great. We were there with 1 and 3 year old children and the grassy area and playhouse were perfect for them to run around. The house itself is very comfortable with beautiful views out the main window overlooking the lake. We spent the majority of our time in the two swivel chairs enjoying the view. The kitchen was well stocked with cooking equipment. If needed, there was good cell phone reception and fast WiFi. A couple of notes, when going to the cabin for the first time follow the directions provided with your check-in instructions, as Google Maps was a little off on the house location. Also, it is a dog friendly house, so if you have pet allergies be prepared. We've been staying on the North Shore at various cabins for about 30 years and this is our favorite cabin of all. Location - perfect, close to Lutsen for groceries and the great gift shop Great Gifts, close to Grand Marais for great restaurants, live music, lots to do, close to hiking trails. The cabin is so comfortable, charming and very close to that magnificent lake and shore line - amazing views out the huge windows, wonderful bed. We loved sitting out on the point which is directly in front of the cabin - feels like being on an island, nothing but water around us. Amazing. We absolutely loved this cabin! The location was perfect for us. We traveled to the Northshore to snow shoe, and we also love to spend time in Grand Marais. The cabin is well equipped with music, board games, and books. The view of the lake is incredible. We will definitely rent this cabin again.